The 21-floor mega-office in central Shanghai will house more than 1,500 staff overseeing projects in China, Japan, South Korea, Southeast Asia, and the Pacific. Prior to the opening of the physical building, an internal integration of its markets was completed earlier this year, according to Adidas’ official 2018 fiscal report. 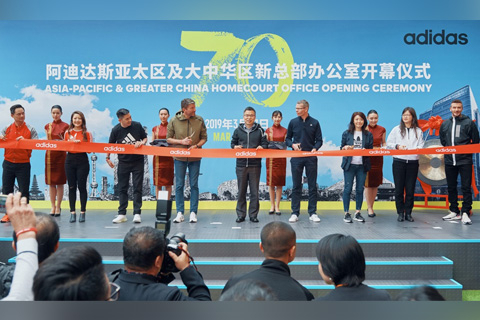 Last year, Adidas also opened its largest Asia-Pacific Brand Center in Shanghai, as a “milestone” in the company’s “planned expansion in the Asia-Pacific and China markets," the report said. Adidas CEO Kasper Rorsted told Caixin that the North America, China, and online markets enjoy priority in the company’s global business agenda, adding that failure in North America and China would mean a losing long-term strategy. In 2018, net sales in the Asia-Pacific made up 33% of Adidas’ total global net sales — its largest regional market. Growth in greater China topped the company’s regional market performance at an impressive 23%, the report said. Adidas is optimistic about its potential in China, despite local rivals’ aggressive moves, including global mergers and acquisitions. Rorsted believes the moves could affect the China markets, but will have limited global impact and are unlikely to offset massive new opportunities Adidas sees in China.